Top 8 gifts to get your Mum for Mother's Day ~ Roses and Rain Boots . 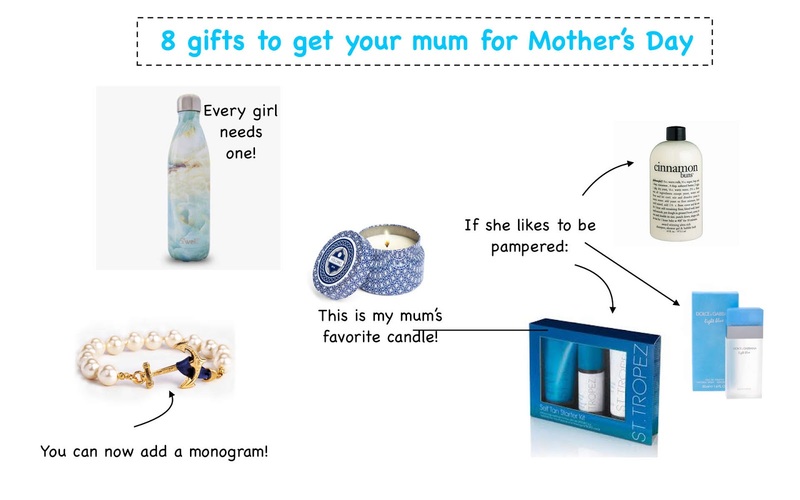 With Mother's Day right around the corner (only two weeks away) I put together my 8 top gifts to get your Mum this year. And yes "mum" is the correct spelling of my English heritage. Ever since studying abroad in London, England and getting to visit lots of family my mom loves to refer to herself as "mum" so it was only fitting, since today's post is all about her! Let's get started with one of my favorite items, S'well Bottles. It is important to drink 8 cups of water a day and it is so much easier and more fun using a cute water bottle. I am loving the new marbled ones, like this pretty blue one here. S'well bottles are also great because if your mum drinks coffee, like mine does, she can use it to keep her coffee hot on her way into work and later keep her water cold. Love items that have multiple purposes. Kiel James Patrick creates the most classic, elegant and beach-like jewelry there is. This pearl bracelet is a favorite of mine because you can choose between two ribbon colors: pink or blue, choose your metal options: silver or gold and if that's not enough you can also add a monogram. Pink and a Monogram?! Yes, Please! I know everyone loves Diptyque Candles, I myself have a big obsession with them because their empty jars make the cutest storage displays for makeup brushes, etc. However; my mom LOVES the Volcano candles from Anthropologie, remember it's about what she loves. This candle is actually used by my favorite person, T. Swift! My mom is always gifting this because she loves it so much and has yet to purchase it for herself. This is definitely a great gift because the smell is calming and pleasing to many. It also comes in a variety of different holders so there's one to match her house (my mom and I both love to match even the smallest things). Philosophy shower gel is my absolute favorite! The smell alone is enough to sell you on the product. It has such a luxurious feel I always know it's helping to nourish my skin rather than dry it out. St. Tropez is supposedly one of the top (if not #1) rated self-tanners at Ulta and Sephora. As a result, I decided to give it a try. I also gifted the starter set to my mother for her birthday and she is beyond excited to give it a try. It was an inexpensive gift that allowed her to pamper herself with something she wouldn't normally spend that much money on a self-tanner. Side note- I have only used it three times but so far I am in love. It does not turn you orange, it dries quickly and it does not smell. This alone is huge for me because I usually apply it in the morning. Perfume is also always a good option. Since again it is something that tends to be a tad more expensive than someone who would want to pay and it is instantly a mood booster. As a result, my mum LOVES to garden and decorate the garden with bird houses. So these cute garden tools or chic bird house are a gift that will surely make her smile. Lastly, remember Mother's Day is all about celebrating all the important women in your life. Be sure to set aside time to spend with them or call (if they are not close-by) and say thank you for all that they do. My mum is one of my biggest supporters. She pushes me to be the best person I can. They say, "behind every great kid, is an even greater mom!" So thanks mum- love you. xoxo. These are all such great ideas!! Thanks for sharing. Very good ideas! I love the candles and Saint Tropez tanning kit! I love the pearl bracelet! Your Mum did everything right bringing you up! !